Hal Lattimore was a Texan - not just due to birth (he was born October 13, 1920 in Forth Worth, TX), but because he was the epitome of everything good that Texas stands for. He had many interests and excelled at all of them - lawyer, jurist, aviator, soaring enthusiast, outdoorsman, college athlete, leader, organizer, devoted husband, father, brother and friend. Fortunately for our sport, soaring was a major part of his life. As for so many of his generation, WW II interrupted his life. He had learned to fly in 1936 prior to the start of the war and volunteered when America became involved. He was assigned to fly transport planes with American Export Airlines and the Naval Air Transport Command. In this capacity he found himself flying the PBY-4, also known as the "flying boat", across the Atlantic to places like Ireland, United Kingdom, North Africa, Portugal, even South America and eventually to post-war Berlin. He had begun his education at Baylor University, transferred to the University of Texas and finished his formal education after the war by obtaining his A.B. and Juris Doctorate in 1948. Among other things during his college years, he was on the fencing team as both a member and a coach and was a recipient of the Southwest Amateur Sabre Championship. He also found time to instruct for the flying club known as the Flying Steers. He joined his Father's law firm in 1948 and was appointed judge of the 96th District Court in 1975, serving until 1987. He was a justice on the Second Court of Appeals from 1988 until 1995 when he retired and joined his nephew in the practice of law. He devoted the next three decades as an organizer and contest director - possibly the best SSA has ever had. He also became an officer and President of SSA as well as Trustee for the National Soaring Museum. In honor of his accomplishments and skills, SSA annually presents the Hal M. Lattimore Trophy to the U.S. Sports Class Champion. In the words of Hall of Famer Charlie Spratt who considered Hall Lattimore his favorite Competition Director: "A somewhat short, round man with a Texas hat and a big cigar and an attitude that only be described as, 'I am in charge and you are not!'" Hal Lattimore was awarded the Eaton Trophy in 1985, the Exceptional Service Award in 1980, 1983 and 1988, the Exceptional Achievement Award in 1991 and the Schweizer Lifetime Service Award in 2003. Hal Lattimore is a legend in our sport for his strict, professional and fair handling of competitions as well as developing somewhat of a reputation for being another beloved soaring character. 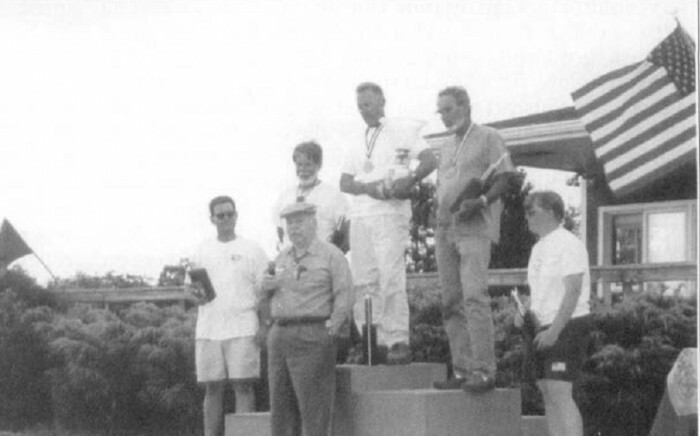 Here, center front, he presents the Lattimore Trophy to Karl Striedieck (1999). Photo by Paddy Welles.